Folks it’s still a Merry Christmas holiday season, and we hope each of you is having a blast! If not, just select your favorite box by Marx and look it over, closely. That familiar warmth will come flooding back. 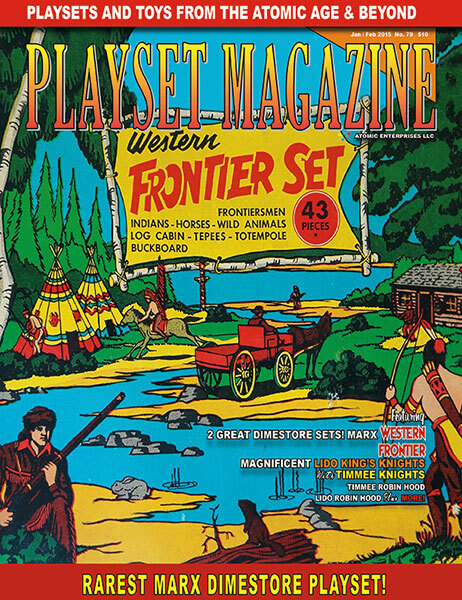 Of course January is coming, and Playset Magazine is about to issue PM79 – in which we play host to the World’s Largest Toymaker – Louis Marx & Co. as we raise the curtain on an unknown playset never before covered in detail in all its minty colorful state -- the Marx “Western Frontier” set. The Western Frontier arrives suitably decked out in a glamorously illustrated carton …. This set was a fighter, too, designed to wage war on the shelves of America’ retail store shelves with Auburns Early American Frontier sets. Louis Marx’ competitive spirits, in the words of playset designer Frank Rice, prompted him to become instantly restless when a competing company had a success. “If Louie knew something out there was selling, he wanted to know why he couldn’t have a piece of it.” This was Brooklyn-style fighting, the type of thing Louis learned on his home turf, and his designers concocted a bang-up job perfect for the small toy store markets and dime store chains. Containing a host of figures and accessories in exotic colors worthy of exploration, Marx’ Western Frontier set has unique figures, wagon and many other parts each contained in – well, we don’t want to spoil the excitement. We know you’ll enjoy seeing this story! On the other hand, this issue is further complimented by a several big features on one of the most celebrated products by one of the lesser-known makers, Lido: The King’s Knights. These feisty, colorful, well detailed knights come in another of the splendidly illustrated cartons of the mid-1950’s bringing our dimestore playset total to 2 – but then we add in Jim McGough stories on the TimMee Robin Hood figures, while Tom Stark brings on Lido’s Robin Hood as well. Jim also leads us through the intricacies of the Lido Kings Knights set, and explains the rare figures, Total now this issue: 4 sets. Lastly folks, it’s time again for us to remind you, our treasured readers, that there is only one vintage plastics publication out there in all of America to celebrate with you our plastic heritage and you’ve got it – Playset Magazine. We try to provide for you the highest quality hallmark publication we can, real effort expended every single issue by who knows how many people, a real gem of the hobby to represent our deepest likes, explore the mint boxed contents and incredible artistry of the Marx playset, celebrate friends and many other treasures, and delve into our collective (no pun intended) history. We do hope keep those subscriptions up! You clever collectors already know this issue and all issues can be yours FREE! because you can easily pay for a subscription using our FREE classified ads (make ‘em 30 words or so, plus contact info!) to offer your own left-over or “changed interests” items and toy parts (like figures, accessories, buildings and the like) while you help to grow your own hobby. PS – our classifieds often have real bargains so explore them every issue! Take advantage of them – non-subscribers pay $17.50 per word but readers get ‘em free. And please tell a friend to renew or join us today and keep your subscription up (Mom is ready to help) and sending in your stories, photos, letters and news all during the coming year of collecting! The next issue is complete coverage of the legendary Marx Korean War set! Thanks so much for reading!